Share the post "Best Investing Books You Must Read in 2018 – Our Top 10"
When it comes to the best investing books, Warren Buffet and Benjamin Graham are role models to the world. Every single investment book list or review site is going to have their books front and centre. Warren Buffett worked for and learnt directly from Benjamin Graham in his early days. Warren then went on to create success beyond anything most people could ever imagine. From being the worlds wealthiest person to having the Midas touch of picking quality investments. 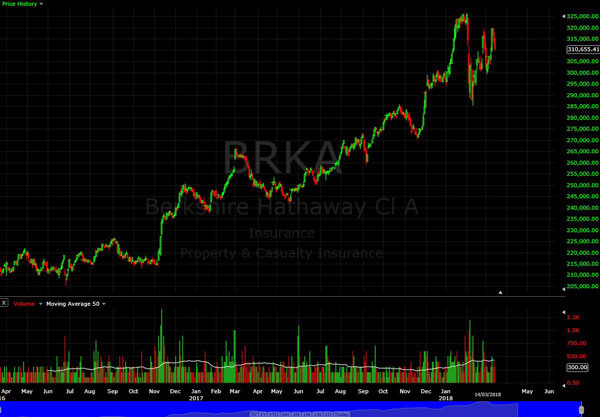 Warren Buffett is also the main shareholder of the most expensive company in the world, Berkshire Hathaway. As of March 2018, the stock price was over $US310,000 a share. If investment success is what you are after then you must build your library of investing books and include one or more of the titles below. The underlying premise of investing success comes down to value investing. Value investing is when you buy a publicly listed stock which is undervalued or lower than their intrinsic value. Most long-term investors determine this through fundamental analysis. But I’m not here to teach you about fundamental analysis or the best value investing principles. 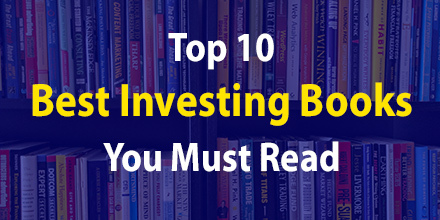 Instead, the books below are the very best investing books available today. The Intelligent Investor is the top investing book to have on your bookshelf. Coming in at 1840+ reviews on Amazon with an average of 4.5 stars out of 5, this is the investment guide you have been looking for. If you are going to invest in the stock market then you must understand the premise of this 600+ investing heavyweight book. Like many others who have turned the pages, this book will change the way you look at Corporate America. Your investment strategy will be expertly guided by Ben Grahams sound advice. Every author is looking to write a best seller. One way to do that is to get a well-known celebrity to endorse your book. Well, imagine if you wrote a book on Warren Buffett and the Rockstar of value investing himself gave you a glowing review? Warren Buffett himself has said this book is First class and has done a perfect job at collating our philosophy. If you are learning about investing, money management and wanting to achieve financial independence, Lawrence Cunningham’s investment guide is the one. With over 260 reviews and only one 1-star review, plus a positive comment from Mr Buffet himself, you owe it to yourself to read this book. You know the ones. They drive expensive cars, live in the best suburbs and their kids go to private schools. The ones who love to flaunt their wealth. Or is the lifestyle largely financed by credit cards? In one of the most eye-opening books (the first edition), the authors uncovered the surprising facts about America’s wealthy. They are frugal, live below their means and typically have average paying blue collar jobs. If you ever get to play Robert Kiyosaki’s CashFlow boardgame, you will see it unfold perfectly. The basics of the game are such that you have to get out of the rat race by having your passive income surpass your expenses. But those who have the highest paying jobs have the highest living expenses. These are the toughest jobs to win the game. Apart from the obvious ‘live below your means and save to invest’, his book is chock full of advice on what it takes to build wealth and hang on to it. Behavioural biases and the evolution of the human mind in terms of slow and fast thinking. Two powerful subjects every investor should be aware of when looking to invest in the stock market. As human beings, we are inherently lazy by nature. This brings up the concept of finding the fast answer first. Unfortunately, the fast answer is usually the wrong one. Because thinking is slow and, relatively speaking, costs a lot of money. Once you understand the frailties of the human mind, you begin to see corporate decisions in a new light. Not only that but you are able to draw faster, more accurate conclusions. Especially when it comes to things like finding the right managed fund, index fund or real estate investment. Amazon has over 2,875 reviews for this book with an average score of 4.5 stars. Coming in at 499 pages, you will want to clear some shelf space for this ‘thinking persons’ book. Simplicity at its best. Jack Bogle is the Founder of The Vanguard Group, which he created in 1974. Bogle knows a thing or two about common sense on mutual funds. When it comes to simple methods of turning your investment dollars into long-term capital growth, this book will set you straight. Bogle makes your overall investment picture crystal clear. After reading this, you will sack your broker managing your investments. You will have clarity on the real truth behind Wall St and the costs involved in investing your dollars. The data provided explains very clearly the path you can take to compound your investment returns and produce more income with less risk. Amazon rates this book a 4.6 out of 5-stars with more than 640 reviews. The common sense is to grab a copy of this book now. Wall Street can be a tough nut to crack. But Dr Joseph Belmonte, in his book ‘Buffett and Beyond’ has uncovered a ratio that every individual investor should know about. Whether you are an experienced investor or trying to find investing books for beginners, Belmonte’s guide to investing is excellent. When it comes to security analysis, there are a few key formulas worth studying. But Belmonte has uncovered a new play on a common fundamental that is well worth the price of the book. If you want to start investing and make money in stocks then this formula is an excellent path to superior stock market returns. Nearly every expert financial advisor or personal finance expert will tell you that performing your daily analysis will take less than 30 minutes per day. But Browne suggests this is more than possible. As far as books on investing are concerned, this one takes a very conservative approach to investments. Browne’s financial plan within the book is to play it steady. Even to the tune of putting some 50 percent of your holdings in cash and Gold. If you are a more active investor, someone who likes to research the fundamentals and pick stocks, this may not be the book for you. Having said that, Browne’s common sense tips about life and investing are some of the best philosophies you will find. Without any hype, this book will help you set realistic expectations and is a brilliant investing for beginners book. Outperformance over the long term and using the averages and statistics to your advantage would be the best way to sum up Siegel’s work. A big portion of his analysis focuses on the randomness and volatility of stocks in the short term. But over say a 17+ year time span, the averages work out and will often provide you with a safe investment opportunity. This certainly plays into Warren Buffett’s theory of doing the research once and holding for the long term. If you are after a rock-solid book on investment principles backed by research, then grab this one. And if you are in your twenties and looking to get started, then you will definitely be inspired to read every page. Start young and build your wealth to retirement. Powerful market predictions. Any investing book that is able to uncover the research and provide clear market predictions is worth paying attention to. The first edition made an accurate prediction about the stock market bubble in 2000. The 2nd edition managed to call out the bubble in the property market. Do you think you should pick up a copy of the third edition to hear what he has to say? You’d be smart to jump on Amazon now and grab a copy, read his research and build our own future safety plan. My mapping out the hot sectors and those you want to avoid, you can start to use his research and common sense advice for investing success. Your investing success. Your alternative may be to just start diversifying and buying random stocks. Or you could use his roadmap to guide you. Make the smart play. Every investor and trader must read Jack Schwager’s Market Wizards books. They distil the very essence of how the best investors and traders in the world outperform the markets year after year. At the end of the day, successful investing is all about allocating risk in order to achieve a return. In Hedge Fund Market Wizards, Schwager uncovers the strategies and techniques used by 15 investment and trading champions. My point is unless you know these legends personally, how else can you get into their investment mindset unless you read this book? One investment strategy every trader should know about is from William Oneil. In Jack Schwager’s previous book title ‘Stock Market Wizards’, William O’Neil outlines his full investment strategy. It isn’t investment advice but one of the most simple guide to investing you will come across. Be sure to grab that book too. The Richest Man in Babylon by George S Classon. This is an all-time classic and would have sold over a million copies ten times over. Rich Dad Poor Dad: What the Rich Teach Their Kids About Money That the Poor and Middle Class Do Not! by Robert Kiyosaki. This book shaped a lot of people’s minds about money, business and investments. It’s an old book but the message is timeless. Principles: Life and Work by Ray Dalio. Grab the book or the audio version. Your life will not be the same again. Powerful principles to success in every aspect of your life, not just investments.